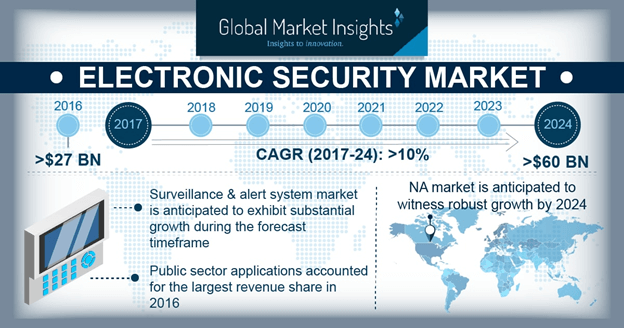 Electronic Security Market size was estimated at approximately USD 27 billion in 2016 and is predicted to grow at over 10% CAGR from 2017 to 2024. Increasing instances of property thefts and break-ins across the world is a major factor contributing to the high growth of the electronic security market. The occurrence of terrorist activities such as contraband smuggling, shoot-outs, and bombings in high risk locations such as government headquarters, trade centers, malls, and transit locations is leading to massive losses of human life and financial property. In addition, the rising inclination of the government of various economies towards safety of the public transportation systems and its smooth functioning will also offer impetus to the electronic security market. The high costs associated with the manufacturing, installation, and maintenance of the equipment is hindering the growth of the electronic security market. Despite vendors providing high quality systems to their customers, power surges leading to faulty equipment, incorrect installations, and inconsistent power sources can cause the alarm to activate. In most municipalities in the U.S., a fine can be charged for repeat occurrences of false alarms ranging from USD 25 to USD 200. Products offered by vendors vary in product complexity with some systems having multiple components and spread across various locations. Operation of such equipment requires high amounts of expertise. Antiterrorist and inspection equipment market is anticipated to experience substantial growth across the globe, owing to the increasing awareness among the governments and customers regarding security against attacks such as the Fort Lauderdale and Bishop International Airport attacks in 2017. The growth of cross-border illegal drug trade and violent acts of terrorism across the world is fueling the demand for the growth of anti-terrorist equipment such as baggage screeners and complete body scanners. The demand for access and control systems in the electronic security market is projected to exhibit high revenues owing to the growing use of automated gates & barriers and turnstiles on the roads and airports. Innovations such as voice activated devices and integration with the connectivity technologies such as Bluetooth is expected to increase adoption from the residential application of these systems over the forecast timespan. Public sector applications account for the largest revenue share. Public spaces such as roads, experiencing heavy traveler traffic, are highly susceptible to terror attacks. The presence of such equipment integrated with advanced software such as face or license plate recognition software is instrumental in the identifying the criminals post-attack. Proliferation of smart home devices and consumer demand to safeguard property and financial assets is anticipated to drive the demand in the residential sector. For instance, Kwikset launched a lock that can be activated through Siri voice commands and connects to Apple devices via Bluetooth. The rising trend of smart technologies and wireless systems is further influencing the demand as it is impacting the ease of using the equipment. In the Asia Pacific region, real and perceived concerns about social unrest and economic growth is contributing to the high electronic security market demand. Industrialization boom has led to an increase in the disposable income of the middle-class population. Consumers are now able to afford luxury and high-priced goods that were previously unattainable. Additionally, governments have tightened security procedures in malls and airports. For instance, favorable government initiatives and projects such as safe city and smart city is fueling the India electronic security market. The increasing presence of religious conflict in India has led to the installation of surveillance equipment near high-risk areas to dissuade the occurrence of fights. The North America electronic security market is expected to grow at a remarkable rate, owing to increasing budget spending by the governments of U.S. and Canada. The trend of integrating biometrics, smart cards, and other non-contact technologies with the existing systems is expected to drive growth. Proliferation of wearable technology, advanced sensors, and voice-enabled devices is anticipated to positively impact the demand for these systems. 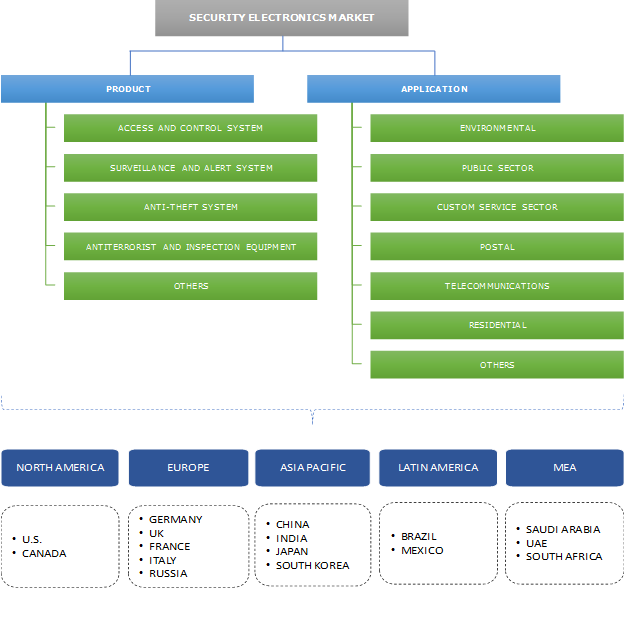 Some of the vendors in the electronic security market include Auto Clear LLC, G4S PLC, Lockheed Martin Corporation, FLIR Systems, Inc., Bosch Security Systems, Axis Communications, Hitachi Ltd, IBM Corporation, Siemens AG, Thales Group, and OSI Systems, Inc. The industry is highly competitive with organizations undertaking business strategies such as product innovations, mergers and acquisitions, and high investment in marketing and advertising. In August 2017, ADT LLC announced the acquisition of the commercial security business from Protec, Inc. These strategic moves were undertaken to sustain growth in the electronic security market. Technological advancements such as the development of remote monitoring security systems, intelligent door locking systems, and IP network cameras provide convenience and increased security to the customer base. Netatmo’s Welcome is a smart camera that is designed to record and monitor facial structure and send alerts when an exception, such as a stranger’s face, is encountered by the device. With the high application of home automation and IoT technology, vendors are increasingly incorporating security electronics into the home automation network as opposed to providing separate systems. Electronic security market enables customers in the commercial and residential sectors to safeguard their property and financial assets. The players provide a vast array of equipment to cater to the varying demands of the end-user such as property size and financial budgets. In the U.S, the total value of reported stolen property was amounted to USD 12.42 billion in 2016. The presence of these equipment can massively aid in the reduction of other crimes such as vandalisms, assaults, and battery. As the sophistication of security threats is rapidly evolving, security solutions are required to foresee potential threats and perform fast reactive measures to detect and limit the extent of the attack. In an organizational or commercial setting, burglaries are not limited to theft of goods but also involve critical organizational and customer information. The International Atomic Energy Agency (IAEA) reported nearly 2,500 incidents of trafficking and theft of radioactive materials from 1995-2015, many of which can be used in the construction of bombs. The application of these equipment can massively reduce the occurrences of such instances and propel the electronic security market growth.